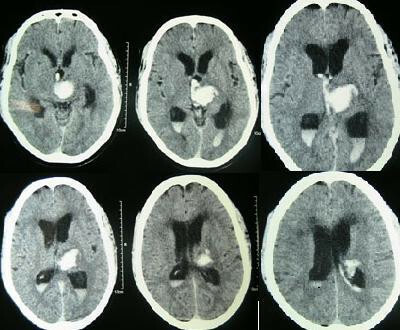 CT scan of intracerebral hemorrhage. Caption reads, "Pre operative CT scan. Representative pre-operative CT scan of a patient showing a thalamic haemorrhage with associated hydrocephalus and blood in the third and both lateral ventricles."